In the wake of the Paris tragedies of this past weekend, we are left with feelings of fear, uncertainty, and loss - and so are our kids. When disaster strikes, our initial reaction is often to shield our children from what happened. We naturally jump into protection-mode, wanting to safeguard our kids from the evils in the world. But, the truth is, our children are going to hear about the terrorist attacks in Paris - and we need to be ready to talk with them when they come to us. The first thing to do is to figure out what your child knows about the attacks - let them lead the discussion. 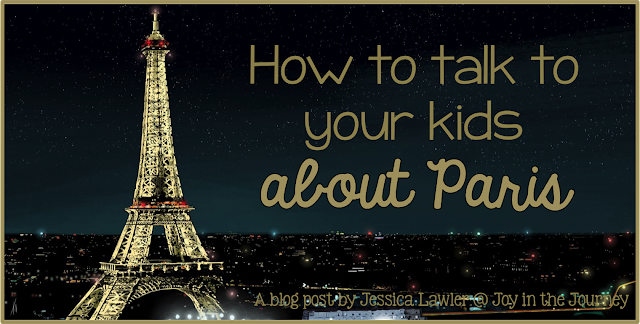 Build on what they know and then explain what happened in Paris, on an age-appropriate level. You don't need to give them all of the details - just enough so that they feel informed and a dialogue has begun. Remember to stay calm. It’s important to try and stay calm as you talk through the events. Children pick up their cues from their parents so if you act anxious they will be anxious. Trust your instincts too. Kids vary in levels of anxiety, and vulnerability. You know your kid and what they can handle better than anyone. Finally, you need to reassure them that they are safe. Psychologists suggest that being able to answer all their questions is not as key as just being around to help them process the news and help them to feel safe and loved. Don't dismiss their questions or their fear - these emotions are real to them and they need to know that you're there to support them during this difficult time. A: Act. Keep routines going—homework, bedtime rituals and so on— because they’re reassuring and distracting. “It is a good time to have them do kind things for others,” says Coleman. Little things like helping an elderly neighbor, or opening a door for a stranger “reminds them that there are kindnesses in this world.” This reduces the sense of helplessness. F: Feel feelings. “Let them know their feelings make sense,” says Coleman. “Saying ‘There is nothing to worry about,’ teaches them that you may not be the person to speak to about their fears.” Let them talk it out and show that you understand. E: Ease Minds. After you’re sure they’ve talked through their fears, you can assure them of their safety. “Reassure them that there are good people trying to help others and prevent future attacks,” says Coleman. The number one thing most experts agree on is that your child needs is your time. The best thing you can do as a parent is be available...Just spending time with him and reassuring him that an event like this is unusual can make a huge difference. Isaiah 40:31 Those who hope in the Lord will renew their strength. They will soar on wings like eagles; they will run and not grow weary, they will walk and not be faint. Lamentations 3:21-23 Yet this I call to mind and therefore I have hope: because of the Lord's great love we are not consumed, for his compassions never fail. They are new every morning; great is your faithfulness. Do you have any tips to add when talking with your kids or students about this heart-wrenching tragedy?